Note: This post belongs to a long series whose summary is here and which aims to present you how to use the CCControl library. In this part we will see how to create and work with a CCControlColourPicker which is an implementation of a colour picker for Cocos2D. It’s a very useful control tool to preview, select and test color values. 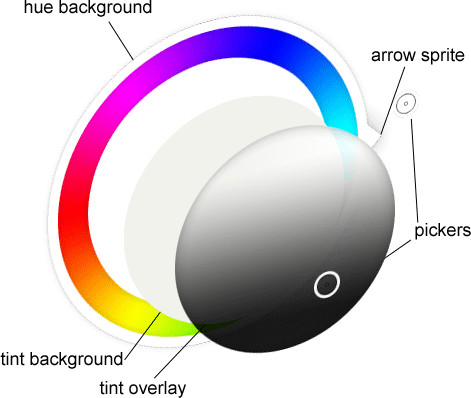 The hue picker allow you to choose the “degree” of the color while the tint picker let you to choose the lightness/saturation. In the next section we are going to talk about the code and more specifically how to create a CCControlColourPicker, how it works and its possible configurations. CCControlColourPicker *colourPicker = [CCControlColourPicker colourPickerWithHueFile:@"hueBackground.png"
By default the chosen color is set to the black. You can find the assets into the examples on the github repository. For the colour pickers you need to listen to the CCControlEventValueChanged event to track its value. But as you can see, with the help of the CCControl API it is very easy. Now we have seen the main functions of the CCControlCOlourPicker we are going to talk about its own properties. To conclude, you can see that the CCControlColourPicker is pretty easy to work with. It can be very useful into drawing application like Sketchshare which uses this component. You can find the code source and the examples on github and the API documentation hosted here. If you have any comments or questions about this article or the component, don’t hesitate to post a comment!